North East Arnhem Land band East Journey made a firm impression with their debut album Guwak back in March 2012. They accrued national airplay, nominations & awards, critical reviews, festival slots, and lead-singer Rrawun Maymuru penned the song Bayini which gave Gurrumul his first No.1 ARIA Chart position. Importantly, it also provided them with a solid slice of city life. New single Bright Lights Big City is a result of this experience. It’s about how we live in a fast moving, shrinking global village. How we forget to live in the moment & reflect that life is for now; how we can remain centered & strong & think what is really important to us amidst all the chaos & technology that compels us to ride on time. Produced by Stevie Salas an LA producer who works with big names i.e. 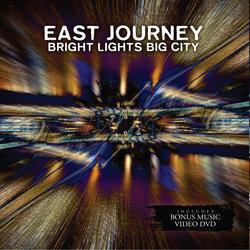 Rolling Stones, Aerosmith, Parliament Funk, Rod Stewart Bright Lights Big City heralds in a new cycle for EJ. Released with a perceptive film clip shot by NIMA award winning Naina Sen & is off an EP due in August. Original members of Yothu Yindi Ben Hakalitz, Buruka Tau & Stu Kellaway recorded with, and mentored the band on this occasion. And released with a stunning film clip.